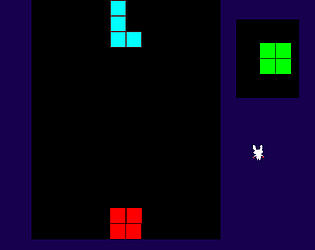 It is tetris, but with 'realistic' game physics. Also feel free to dig into the zip file with the source! So the windows executable technically loads, but it just says "no game" with a balloon. Yours may be another game I'll have to find through stream archives if I have time. I finally got it to work after installing LOVE. I gotta say, very interesting concept! Was very enjoyable to play! I loved the bouncing off of other tiles, it was so jarring when expecting tetris. A couple notes: The pieces stick to the side if you hold an arrow key, it can pause the gameplay loop effectively and stops piece rotation too, maybe not intende. Also, your little bunny guy is SO SMALL! It's so well animated and funny, you have lots of space to blow that guy up! Overall, fantastic job and glad I could finally get it working! Some sound FX would be sweet with this. Thank you for your feedback! I packaged an executable for windows now (im pretty confident it works, but as a non windows user i do not know for certain). i didn't include executables for other operating systems though. Also, this game is indeed partly inspired by the same xkcd strip that also inspired the game entry you mentioned, so the similiarity isn't coincidential. i'll be looking into providing an appropriate acoustic background for this game. Sorry friend, I cannot figure out how to get the game to open. I am unfamiliar with .LOVE files and their workings. I get an error when attempting to open this file with "LOVE.exe". The love2d framework needs to be installed in order to play .love files (I noted that in the install instructions, which are unfortunately only visible). However, i just added a version packed with an windows executable so users who don't have it installed don't have to go through the hassle of installing love2d for a game that's not even particularly impressive. (although i cannot verify that it is actually working because i am running a gnu/linux installation rather than windows; if not, please do tell me). I'm still having issues with the new package, but fear not! I will make a more better-er attempt at getting it to work on the morrow!